Assoc Prof H.Jazri has been in the field of information security for 30 years ranging from military application and government ICT security applications covering both IP based environments and secure tactical radio communications, corporate and private sector security and privacy applications, and community projects such as privacy online, child online protections and CyberSAFE for Schools. He was also involved in the ICT Security research projects and among his notable contributions were establishing the Computer Emergency Response Team (CERT) for Malaysia, co-founder of the Asia Pacific CERT and founder of OIC- CERT. Mr Jazri has served as a member of the international board of ISC2, USA for several years and ISC2 advisory board member for ASIAN region for many years. He is the founder, CEO and first director of the CyberSecurity Malaysia until his retirement. 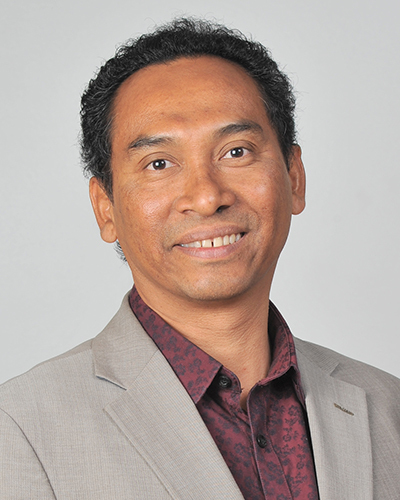 Assoc Prof H.Jazri is the recipient of the prestigious Harold Tipton Lifetime Achievement Award, a global award by the International Information Systems Security Certification Consortium Inc, to renowned security professionals in the world. H.Jazri is also the recipient of ASEAN Chief Security Officer award, ASIAN Information Security Leadership Award, Visionary CEO of the Year by Computer Industry Association Malaysia and Platinum Award in Entrepreneurship by the SMI Association Malaysia. In the Namibia University of Science and Technology, Assoc Prof H.Jazri is part of the successful teams of the Faculty of Computing and Informatics that initiates and grows the information security and digital forensics fields through courses and research projects at degree and post degree programmes, Masters and PhD research in the field of information security and digital forensics. He is also collaborating with the Office of the Prime Minister of Namibia to implement ICT security policy and guidelines for Public Service and E-Government projects in Namibia. Mutunda, JK.,Jazri, H., (2015). Using Digital Forensic Readiness Model to Increase the Forensics Readiness of a Computer System. ETNCC 2015 - IEEE Conference Proceeding, Namibia. Musarurwa, A., Jazri, H., (2015). A Proposed Framework to Measure Growth of Critical Information Protection in Africa. ETNCC 2015 - IEEE Conference Proceeding, Namibia. Ariffin, A., Slay, J., Jazri, H., (2012). Digital Forensics Institute in Malaysia : The Way Forward. Digital Evidence and Electronic Signature Law Review. Hamzah, Z., Jazri, H., (2005). E-Security Law & Strategy, Lexis Nexis. (Chapter in the Book). Harold Tipton Lifetime Achievement Award 2010 by the International Information System Security Certification Consortium, USA. Platinum Entrepreneur Award 2013 – SME Recognition Award 2013 by the Small and Medium Industry Association of Malaysia. Asia Pacific Information Security Leadership Achievement, Senior IT Security Professional Category, 2009 by the International Information System Security Certification Consortium, USA.